International Support: we now scan cards in 22 languages, up from only one until now (English). This is long overdue and we hope it helps our international friends. Affiliate Program: we want to pay YOU for something you already do, recommending the app to friends. Get started towards untold riches now J … details below. This update also provides a significant accuracy improvement through a better image processing and simplifies some of the user interface. 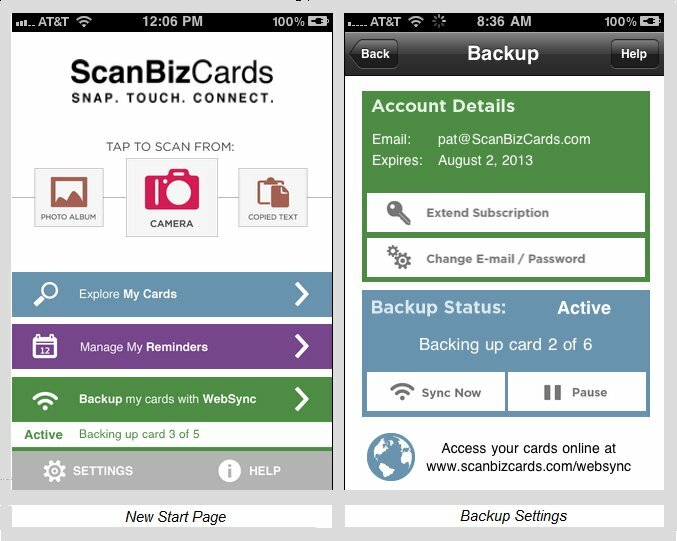 ScanBizCards now support non-English business cards for the very first time. Supported languages are: Czech, Danish, English, German, Greek, Finnish, French, Hungarian, Italian, Lithuanian, Dutch, Norwegian, Polish, Portuguese, Romanian, Russian, Slovakian, Spanish, Serbian, Swedish, Turkish, Vietnamese. The language support means two things: first and foremost it means that special characters and accents in these languages are recognized. It also means that we try to understand what constitutes a job title, street address and other elements in that particular language – and to improve this part we really need your help! Use the “Report A Problem” button liberally! Step 2: Review each item and validate (save) each item properly recognized in that language. URLs and email addresses will not appear correctly at that stage and can be ignored or swipe-deleted. Step 3: Scan again in English. This will preserve the Russian/Greek items found previously and add recognition of English text on the card such as email addresses. Note #1 – Converting credits to Web Sync months: for those of you using Web Sync, you can have the referral credits automatically applied each towards one month free Web Sync. Just make sure to use the email address you use for Web Sync when referring friends then check the Web Sync box on the “Tell A Friend” page (see URL above). Note #2 – Vanity Refer A Friend URLs: you can make the same recommendation of the app on your blog, newsletter etc – just insert the same URL for the free 2 weeks upgrade with your email address – see http://www.scanbizcards.com/tellafriend for details how it’s done. Better yet: that page lets you create a URL that’s easier to remember, called a “Vanity URL”. A vanity URL makes it easy for your friends to remember if you tell them about it in person (or if you are standing outside the Grand Central train station during rush hour urging everyone to try the app). This is a constant ongoing work for us. This update provides a significant improvement to accuracy by doing a better job at pre-processing images before text recognition. You should note the difference while watching the black & white image shown mid-way during scanning. The folders view and cards list views now sport a cool black background – tell us what you think! Better organization of settings: we still have lots of settings, but at least now they are organized in sections with explanations for each setting (truth is we did it for Danny who kept forgetting what these settings do). A nasty iOS4.2 issue was causing us to fail at assigning contacts to groups – now fixed. Sharing, bulk upload: and while you are looking at your cards online, note the option to share a custom folder with others (w/optional password): open a folder, click “Sharing Settings For This Folder” on the top right. Note: does not work for Recent Cards, only named custom folders. Also: under “Batch Actions” note the option to import many card images at once into your Web Sync account, which mean into the Recent Cards folder of your iPhone later. I have a Gorillapod tripod myself and I highly recommend it! Note: the iPhone 4 version has just been released, if you have the iPhone 3G/3GS make sure to select the older model of the Gorillapod.